Here we are after another Scrum sprint with our usual report about the activity in YaST development. 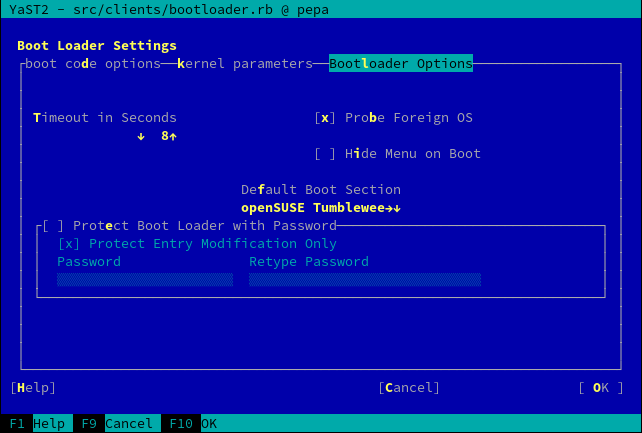 YaST bootloader module got a new option, Trusted Boot (FATE#316553). It installs TrustedGRUB2 instead of the regular GRUB2. Trusted Boot means measuring the integrity of the boot process, with the help from the hardware (a TPM, Trusted Platform Module, chip). It enables some interesting things which we unfortunately haven’t provided out of the box. 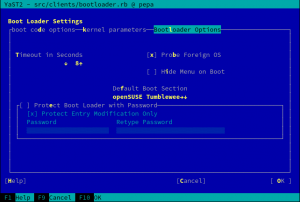 We give you a bootloader which measures the boot integrity and places the results in Platform Configuration Registers (PCRs). First you need to make sure Trusted Boot is enabled in the BIOS setup (the setting is named Security / Security Chip on Thinkpads, for example). Then you can enable the new YaST Bootloader option that will install TrustedGRUB2. In the description of this pull request you can find a more detailed explanation including some commands and hexadecimal dumps to check the result. Geek pr0n! When looking at any software project, it’s common to find some feature or piece of code that is there due to the so-called “historical reasons”. YaST2 code-base has been around since 1999, adapting to changes and new requirements in a (almost literally) daily basis since then. That leads to a new level of heritage – the “prehistoric reasons”. Working in the YaST Team implies coding, debugging, testing… and archaeological research. We got a bug report about the installer “stealing” some SSH host keys (but not all of them) from previously installed systems. It was actually the effect of a little-known YaST feature that can look surprising (not to say weird) at first sight. Ten years ago, somebody decided that when installing SUSE in a networked environment, where people use SSH to log in, it was better to import SSH keys from a previously installed Linux than to get that “ssh host key changed” for everybody who tries to connect. The rational was that forcing everybody to change the ~/.ssh/known_hosts file often could become a security breach, since people could get used to ignore the security warnings. Welcome to the world of historical reasons. 🙂 Moreover, it was decided that the operation should be performed without showing any information to the users, in order to not confuse them. More or less at the same time (we are still talking about 2006), it was decided to introduce importing of users from an existing system, this time with user interaction. The YaST developers decided that it would be fine to share some mechanisms in the implementation of both features. Another step into the historical reasons void. Fast forward to the present. After several fate entries, bug reports and redesigns over the years, we decided to make the importing of SSH host keys more visible and usable, to make both functionalities (SSH import and users import) more independent and more clean and to take the first step to clean up the insanity introduced through the years (see fate#320873 for details). Notice that one of the options is “none”, so copying of previous keys is not longer enforced. 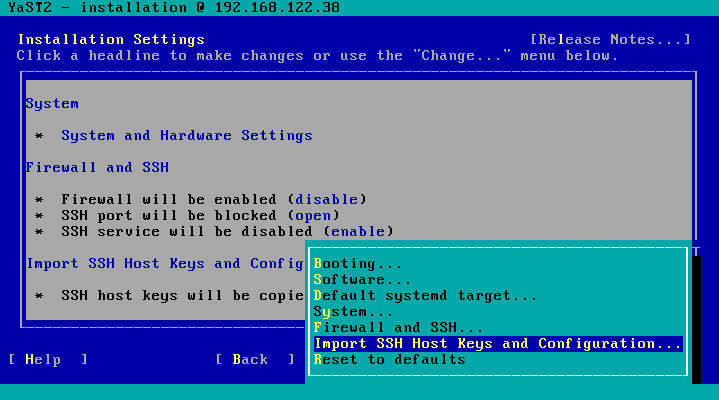 In addition, now is also possible to import the rest of the SSH configuration in addition to the keys. When installing from a local media, like a CD/DVD or an USB stick, those sources were still enabled after the installation. It potentially could cause problems during software installation, upgrade, migration, etc. because an old or obsolete installation source is still there. On the other hand, if the source is physically removed (for instance, ejecting the CD/DVD), zypper will complain about that source not being available. Fortunately, this behavior will change in future SUSE/openSUSE versions. Now, at the end of the installation, YaST will check every local source disabling those whose products are available also through a remote repository (so they’re not needed at all). Support for bonding interfaces with NPar or SR-IOV capabilities has also been improved during this sprint. Too many weird words in one sentence? Don’t worry, we actually love to explain things. Bonding is a way to combine multiple network connections to increase the throughput and bandwidth and to provide redundancy. On the other hand, NPAR and SR-IOV are technologies that provide the capability to create multiple virtual devices from the same physical or ethernet port. Until this sprint, YaST offered no way to know whether two interfaces with these capabilities were sharing the same physical port. As a result, users could bond them without realizing that they were not getting the desired effect in terms of redundancy. Information about the physical port ID has been added to all the relevant dialogs for all devices supporting it, like it’s shown in the following screenshots. Additionally, the user will be alerted when trying to bond devices sharing the same physical port. Last but not least, following the Boy Scout Rule (also known as opportunistic refactoring), we took the opportunity to fix some small quirks in YaST Network, like the counter-intuitive sorting of devices in some lists. Somebody said once “a promise made is a debt unpaid“. In the previous post we promised you all an article on Snapper.io detailing the new space-aware cleanup introduced in Snapper. Here you are! Enough for a blog post. That’s of course not all we did during the last sprint (to the contrary, it’s just around 20% of the finished work according to the story points count) but, you know, we need to go back to hacking! The wait is over, the report of the latest Scrum sprint of the YaST Team is here! In the previous post we promised that after this sprint we would have much more to show… and now we do. This sprint was quite productive, so let’s go straight to the most interesting bits. The YaST self-update feature mentioned in the two previous blog posts (sprint 16 and sprint 17) has also received a couple of improvements. At this gist (with screenshots) you can see some of the fixes done when going back and forward in the work-flow after an installer self-update. But even more important are the improvements done in AutoYaST to properly handle the new feature. If you want to use your own self-update repository you have to specify it on the boot command line. This is easy in a single installation, but if you want to install many machines using AutoYaST then writing the possibly long URL at each installation again sounds annoying. In this sprint we improved handling of the custom update URL so that it can be read from the AutoYaST XML profile. Now you need to write the custom URL only once into the profile and it will be used automatically in every AutoYaST installation. There is not much to show in the UI, the log proves that the self update was really loaded. You can find more details about specifying the URL in the profile and evaluating the self-update repository URL at the documentation. 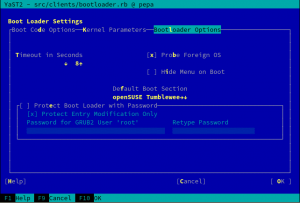 For quite some time, we have had the plan to stop using Perl-Bootloader as library for yast2-Bootloader and finally we managed to make it happen. There were many reasons for this change. From the user point of view, the most visible reasons were speed and size. Getting rid of Perl-Bootloader means that we not longer perform hardware probing twice (one for Perl-Bootloader and another one for grub2-config), making kernel updates faster. In addition, we are not only simplifying and reducing the size of yast2-bootloader itself. Dropping the Perl libraries and other associated dependencies, makes possible to have a smaller minimal system, something quite relevant in various environments and scenarios. From the developer point of view, the main reason was to unify the used programming languages and also reuse existing solution for file reading and parsing. 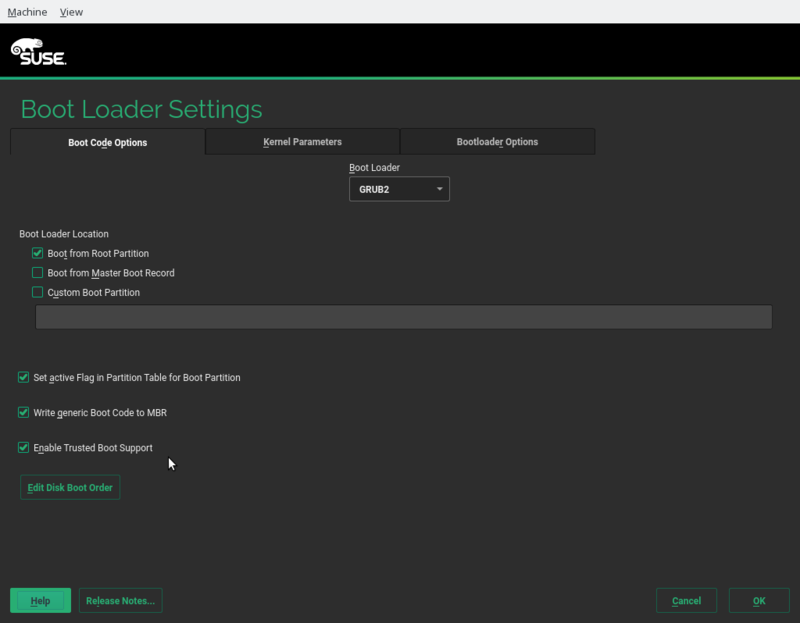 Now yast2-bootloader uses an Augeas file parser and serializer, which does not only allow us to have less code to maintain, but also offers smarter editing and better handling of the comments in the configuration files. As nice side effects, this change also leaded to the removal of a lot of work-arounds, the simplification of the installation work-flow for bootloader and a very visible improvement in the source code quality. In addition, we improved the test coverage of the whole module to make sure we didn’t break things too much. But all those would be bold statements if we wouldn’t have some geeky numbers to prove then, so here they are. Of course, after such a big rewrite is not unlikely that some new bugs will pop up, but we really believe the improvements are worth the price. For the storage-ng project we made a big step towards a modern system. We do not use geometries and cylinders for disks any longer. Instead we only use sectors. The advantage for the user is much better control over the size of new partitions. Since so far the size had to be a multiple of the cylinder size, often 7.84 MiB, it was not possible to create very small partitions, e.g. for the BIOS boot partition. Also the size of partitions was usually not the exact number entered in YaST, e.g. 509.88 MiB instead of 512 MiB. Now the size of partitions is as accurate as possible with the hardware, so usually a multiple of 512 B or 4 KiB. Like in the past we also takes care of optimal partition alignment to avoid performance loss due to read-modify-write cycles. Snapper is a great tool, but the current default configuration usually causes it to be a little bit too greedy with disk space. During this sprint a new set of cleanup rules was implemented, allowing a much more reasonable usage of the disk. 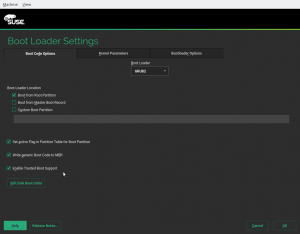 The feature is already developed, submitted to Factory and even integrated into the next version of SUSE Enterprise that is right now being cooked. 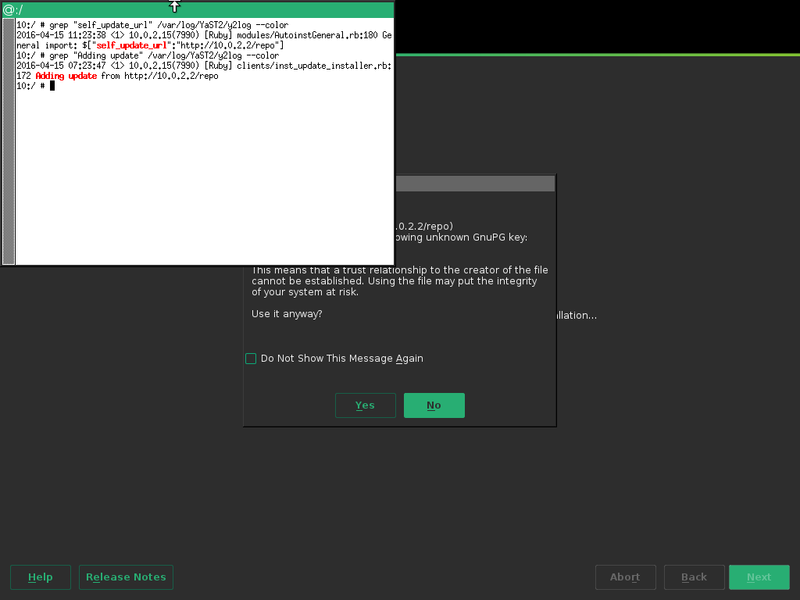 But, as you all know, the testing work-flow of openSUSE Tumbleweed (staging projects, openQA and so on) can sometimes cause some delay until the new feature appears in the distribution. As soon as the new feature reaches Tumbleweed, a blog post explaining the new functionality will be published at snapper.io. Stay tuned! and below the new appearance, which adds more explanation to the password specification. Of course, the help text (not displayed in the screenshots) was also improved to reflect the changes. The installer by default installs the recommended packages so the default patterns are automatically installed in the initial installation. However, this approach makes troubles during system upgrade. If you remove some packages or patterns which are installed by default and then you do a system upgrade the installer will (silently) add the removed packages or patterns back as the Recommends dependencies will pull them in again. The solution is to provide another mechanism for selecting the default patterns. The new implementation allows using a specific Provides RPM package tag which specifies the default pattern name for the product. The new tag is defaultpattern(pattern) where “pattern” is the name of the default pattern. YaST looks for these specific tags and collects the pattern names for all installed or updated products. This step is skipped during package based system upgrade so this should avoid adding unnecessary packages in system upgrade. Obviously it depends on the products themselves to switch from the RPM dependencies to this new style. So far it is supported only by the SLES12 SP2 High Availability addon. See more details at https://github.com/yast/yast-packager/wiki/Selecting-the-default-product-patterns. A couple of reports ago we made public our intention to squeeze some booting experts brains in order to create Ruby classes capable of always proposing a sensible partitioning schema. The delicious result is finally at the repository, accompanied with a rather complete document explaining the logic behind the code. If reading Ruby code is not your thing but you are geeky enough, you can also review the output generated by the RSpec unit tests, which shows how the new partitioning proposal will behave in all scenarios from the booting requirements point of view. In addition, we took the first steps to develop a smarter way of proposing a solid partitioning schema when the free space is split over several different disks or disk chunks. Is still a work in progress, but you can trust that in the future (open)SUSE will do a nice job when looking for a home for itself in your sparse hard disk space. The management of storage devices in a Linux system running in a S/390 mainframe is a tricky topic full of corner cases. 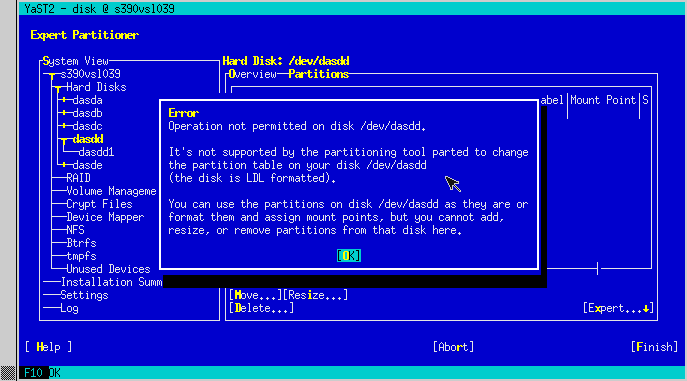 Depending on the type of disk, its format and other factors, some apparently simple operations (like creating partitions) are not possible. If you are interested in the subject and want to learn a lot of weird acronyms, we would recommend this article. 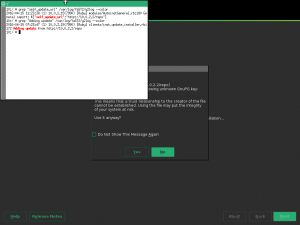 We realized that the expert partitioner allowed the user to specify some operations that were actually not supported, which resulted in the installation being aborted at a subsequent step. 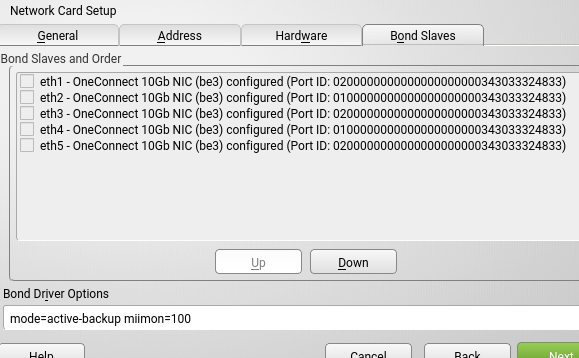 To avoid that situation, we improved the expert partitioner to detect those unsupported S/390 configurations and alert the user, like it’s shown in the screenshot below. We got a new server to run integration tests via openQA and AutoYaST. The AutoYaST tests now used to take 8 hours but now finish in 1.5 hours. Even though we call ourselves “the YaST team” we are happy to share the project with other teams in the company and people in the community. During this sprint, we had a chance to review code for two significant features. The authentication client module, dealing with LDAP, Kerberos, Active Directory, NSS, PAM, and SSSD, got a big upgrade (yast2-auth-client-3.3.7). Since a couple of months, Tumbleweed has had a package for firewalld (see FATE#318356 ). Work is underway to make YaST aware of it but it has not been merged yet. If you are interested you will have to find it in the git repo. Definitely, this was a very productive sprint and, as usual, this report is just a sample of the total work delivered by the team. To be precise and to please number lovers, the features and fixes covered by this report represent 85 Scrum story points out of a total of 124 delivered ones. Hopefully enough to keep you entertained until the next report in about three weeks. See you then!